Erin Lundgren, at left, accepts the $10,000 prize in East Jefferson Rotary’s Pot o’ Gold raffle from TJ Plastow, center, who sold the winning ticket. On hand to congratulate all was Rose Bowman, the District Governor for Rotary clubs in Northwest Washington and Southern British Columbia. Erin Lundgren, a long-time Jefferson County employee and the current clerk of the board of the Jefferson County Board of Commissioners, won the top prize of $10,000 in the recent Pot o’ Gold raffle sponsored by East Jefferson County Rotary Club. 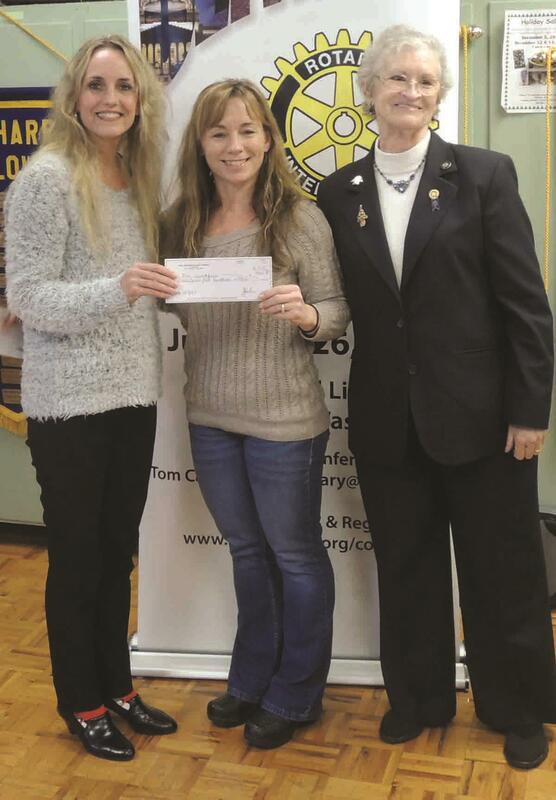 Promising to share her winnings with others, Lundgren promptly donated $500 back to East Jefferson Rotary. In addition to the first prize of $10,000, 12 other prizes were given away. Second prize was $1,000 in groceries from QFC or $500 cash and third prize was a resort package for two nights at the Inn at Port Ludlow. Gift certificates for other prizes were donated by Hadlock Building Supply, FairWinds Winery, Olympic Equipment Rentals. Dana Pointe Interiors, The Belmont Restaurant, Sonia's Bayside Barber Shop, the Port Townsend & Jefferson County Leader, Ajax Restaurant, the Valley Tavern, Chimacum Café, Ferino's, Pane D'Amore Bakery, Fiesta Jalisco Restaurant and Marrowstone Vineyards. Proceeds from the raffle will help fund student scholarships and other community projects sponsored by East Jefferson Rotary. Last year the club awarded $21,000 in scholarships to Jefferson County students. Projects in years past include construction of the bookmobile garage at the Jefferson County Library and the picnic pavilion at HJ Carroll Park.